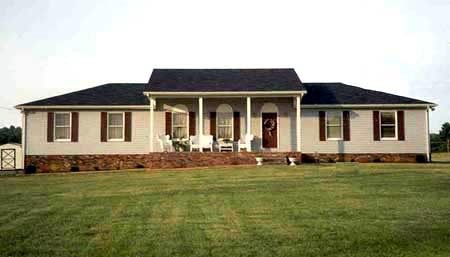 The hipped sides of this three tiered roof add a sense of formality to this practical three bedroom ranch. Columns outline this beautiful home's living room and dining room, adding to the feeling of elegance. The deck is cleverly designed to offer an outdoor retreat -- complete with a hot tub -- off the master suite. The master suite also includes a private bath, while two additional bedrooms and a full bath complete the sleeping wing.